Part 2: Can you breed hypoallergenic cats? The man who sells hypoallergenic felines answers. Only at Best Buy stores nationwide. We're inside a small veterinarian office in london and this is the guy who sold us a $7,000 allegedly hypoallergenic kitten. The gene has got a mutation. A kitten we're sure he bought from a nearby breeder for a couple hundred dollars. This cat will not make anybody allergic? Here's where I decide to let the cat out of the bag. Simon, we're from abc news and we're recording you right now. Can I say in my decades on the job this has got to be the calmest reaction I've ever seen to a surprise interview. All right. We actually had many of your cats tested, and we compared them to shelter cats and your cats are no more hypoallergenic than a cat you can pretty much get for free. So far we have had great success. Have you spoken to our clients? Yes. They say in some cases they've sent you money and not gotten a cat. Not necessarily. Do you think the prosecutor is lying? I don't know. I haven't had any calls. Did you breed this cat or did, in fact, you pay 260 bucks or 150 pounds for this cat at a breeder in es ex and sell it to us for 7 grand? No, I didn't. You're sure about that? Yep. You're absolutely sure? Yep. We head outside where I keep asking about that local breeder. After several attempts -- as soon as you walk away we're going to call this breeder in es ex and ask whether this cat that yold us for 7 grand isn't the same cat that they were selling for $260. You're confident that that breeder is not going to tell us that we just paid a cat for a lot? Did you buy this cat from a breeder in es ex? Yes, we did. That's a pretty big markup? Mark juch is markup. I sell them for what customers will pay. If you bought this from a random breeder, why are you confident this is a hypoallergenic pet? He explains that he uses dedicated breeders in america. Here he claims he has a message for identifying cats he believes are hypoallergenic. It's scientifically proven hypoallergenic cat based upon it having a naturally occurring mutation that we have had studied and confirmed by third parties. I'm happy to send you reams and reams of scientific data and put you in touch with 30 or 40 clients. Anything else you want to add? Talk to our clients. We agree on a 30-day deadline for simon to send us his proof. I take the cat back with me to my hotel room for the night. Do you want to help me write? The next morning we're off to drop the cat off at his new temporary home. I got a call quite late last night from t breeder who said that the day before simon dropped the cat off with us, he came and bought this cat from her. He was in a big hurry she aed and claimed that the cat was for his mom. He paid around $250. When I told her we paid 7 grand she laughed her head off and recommended that he call this little guy dollar bill, so we're going to go with that. Dollar bill does not travel light. This is jamie. He and his girlfriend has agreed to cat sit dollar bill for as long as we need. Stopped crying, yeah. It's now been well over 30 days since simon promised to send us, quote unquote. Reams and reams of scientific data. This is reams of printer paper. This is a five page dna report on three of simon's cats. This is not proof that simon's cats are hypoallergenic. As for the 30 to 40 happy clients he promised us, in the end he only gave us five names and we were only able to reach four of those people. But each of them did, in fact, say they are satisfied with their allerca cat. How does he respond to the allegations that he's taking people's money and not sending them cats. An order is noncancellable, nonrefundable and there is no timetable on the business's obligation to deliver a pet. Does that mean, like, forever? Now, you may be wondering about little dollar bill. For good measure we sent him to the vet to get his samples processed by the lab. The results showed that he, too, caused reaction levels similar to those shelter cats. There are some clear winners in this whole scenario, including dollar bill and his new owner. It's been a couple months since we dropped my man db off with jamie and his girlfriend. Initially we thought we would bring him over to america and find him a loving home here. Jamie and his girlfriend fell in love with the cat and they're going to keep him. We're going to skype to get an update. He looks like part house cat, part kuger. The kooger comes out about 5:00 a.M. We're going to send you a bill for 7 grand. That's fine. Absolute bargain. 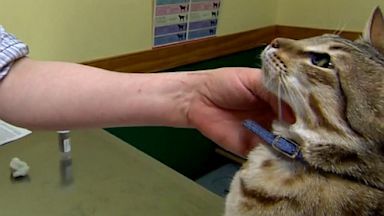 For those of you who may have allergies but are desperate to have a cat, there may be some hope as long as you're not severely allergic experts say there are some things you can do to minimize the problem like washing the cat frequently and keeping him out of the bedroom. In some, no need to plunk down thousands of dollars. If you want a cat, check out the LaTOYAs AND JANETs AT YOUR LOCAL Shelter where you can save a life for next to nothing. What's up jazzy? How are we doing? Hypoallergenic Cat: Scientific Breakthrough or Hype? ABC's "The Lookout" investigation explored allegations against Allerca. Part 1: Experts test whether hypoallergenic claims are the real deal in selected cats.